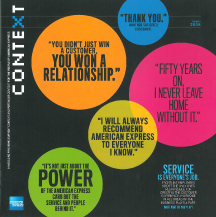 This is a piece I wrote for American Express’ internal publication, Context. It appeared in the summer, 2008 issue. When Rohit Berry thinks of extraordinary service, he thinks of Ritz-Carlton. During a dinner at one of the chain’s upscale hotels years ago, Bery, vice president, Customer Experience, told his waiter how much he liked the french fries. “They are the best french fries I’ve ever had,” he remembers saying. From then on, every time he at at a Ritz Carlton, he always received — unsolicited — a 14-inch plate of fries, even in Bali, where he went for his honeymoon. “That was incredible, it was really ridiculous — and I mean that in a good way,” Bery says. To read more, download a pdf of this publication here.